I was so excited about this show returning and I was not disappointed. 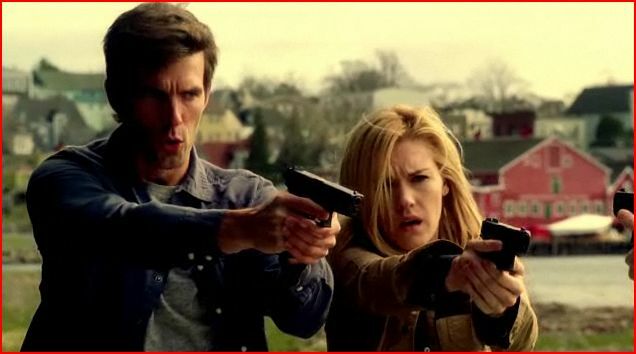 Now on to the Season Two premiere of Haven, The Tale of Two Audreys. This episode begins literally where the last episode ended. Audrey is face to face with a woman who is using her name or is her? WOW again I felt so much like WTH is going on but luckily Audrey felt the same way. LOL. The season one finale ended with Audrey being approached by a woman saying she was Audrey right after she had told Nathan that she was Lucy. Now to know more about Lucy review season One I will have to myself to remember all the details but it has something to do with Audrey/Lucy’s mother. Now Emily Rose who plays Audrey, the one we are used to seeing, is a great actress as far as I am concerned. I liked her from the start. On IMDB it shows she has only been acting for around five years or so which is not that long in hollywood. I love the way she plays Audrey as innocent, smart and a bit lost at times. Audrey and Nathan have their guns drawn on the fake Audrey, who we will call Faudrey, for now. Throughout the episode Faudrey and Audrey tend to repeat themselves or/and follow the same lines of reasoning, just a heads up. Faudrey also has her gun drawn as she holds up her FBI badge with her other hand. She says, “she knows I am Audrey Parker,” and for a second we see Audrey waver as though maybe something is really wrong but its only for a second. Faudrey is convinced she might really get shot after Nathan says “I Know her, you just crawled from under a rock, drop the gun.” I can appreciate that he didn’t waver and believed there was no issue with who was whom. Faudrey puts down her gun. While that is happening something strange is going on at the Good Shepherd Church. We zoom in to find a little boy playing near a stream not far from the church. He is playing with a paper boat. He follows it curiously as it floats. 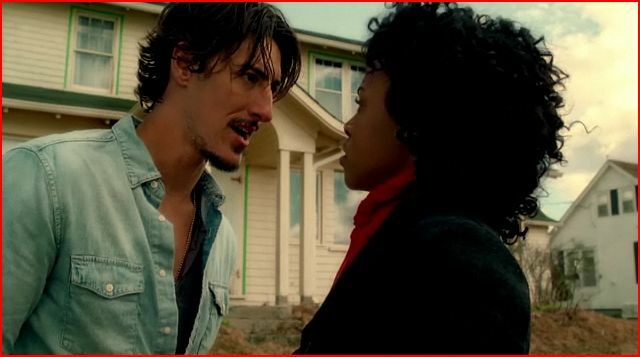 Duke Crocker walks up and for moments also watches the boat on its watery track. The pastor comes out the door to meet him. Now this pastor is someone I remember from last season and he is an unrelentless religious figure. The pastor is what most would call a zealot and he actually creeps me out with his pronouncements. We find out that the pastor has called Duke to come by to see him. Duke refuses to go inside the church and I don’t blame him because that pastor just has a shady look to me. As they begin to talk we get another flash of that little paper boat as it continues on its journey. Its a back and forth between the little boy and Duke with the pastor. They talk about Duke’s dad and the boat gets caught up down stream in the grate or something. The pastor tells Duke he wants to protect the town and help him in any way that he wants. According to the pastor Duke’s father was a righteous man though Duke doesn’t really seem to agree. This reminds me of those people that you on the street who judge you by the way you dress or the shoes you wear; they have no clue but they are ready to prejudge we all do in a way. The pastor has his own agenda its obvious even from last season. He pretends its about the town but I believe he ultimately wants power; sorry for getting ahead of myself here but I have seen that all before in real life. Audrey looks spooked after they get Faudrey in the van. Nathan asks her out to lunch like nothing weird just happened which was amusing. 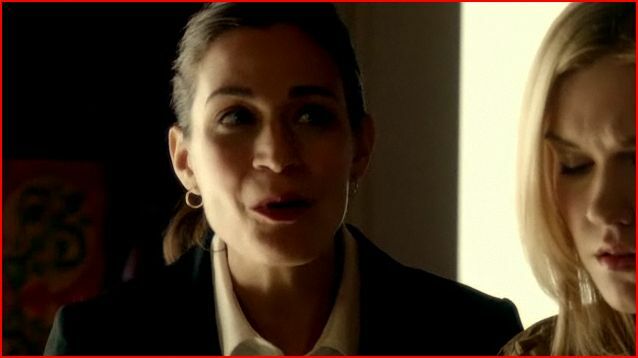 Audrey finally voices her concern after she states that the gun and FBI badge looked real that Faudrey was carrying. “I was someone named Lucy once,” Audrey says as if to say maybe Faundrey is her or she really is starting to doubt her own identity. Nathan cuts Audrey off by explaining like ever other person who has issues in their town Faudrey is someone they have to deal with nothing more. Audrey changes the subject to the elephant in the room or in this case the dead chief of police, in the back of Nathan’s car. Nathan says he is dealing with it but she wants him to get what’s left of the body buried, what is actually a pile of rocks. They are almost done with the conversation when suddenly frogs begin to fall from the sky like rain. Now that is a lot of frogs. 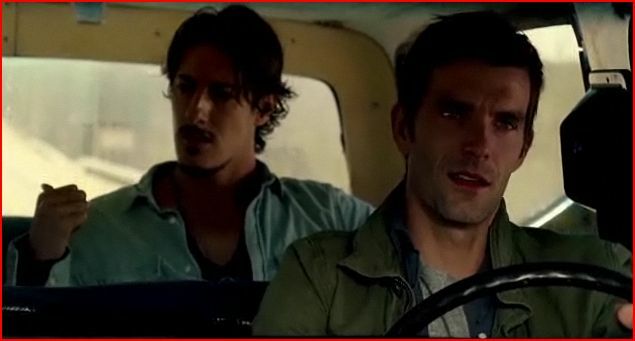 They jump into Faudrey’s car for safety, since it is the closest vehicle to them at that time, as they look around wondering what is happening. The theme music swells as credits role then we are back into the action. Their first thought as to why frogs fell from the sky is Faudrey. I think this is funny because so much strange stuff happens in this town because of people; in any other show it wouldn’t be a first thought but here yep it is. I love it. Now Faudrey is not as surprised as she should have been. I mean I would have possibly freaked out or I would have wanted a real explanation. On the other hand if she is Audrey she may be intune with the drama/dynamic of the town already. Everyone was just so calm I am afraid it felt off to me. Faudrey wanted to get the police station to get her identity cleared up and whereas Nathan and Audrey finds out Faundrey called Agent Howard, her boss while the other two were outside dealing with frogs as well as their own personal drama. We see a swarm of something flying through the sky then hear a crash. 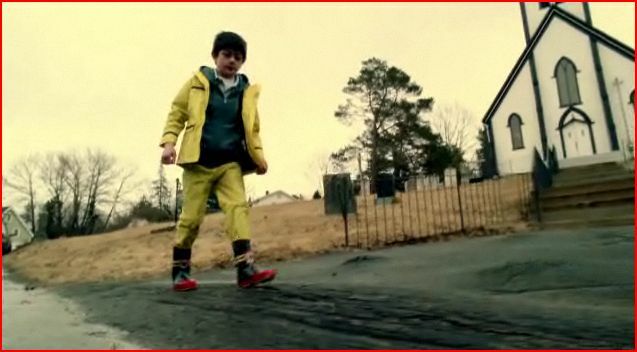 The three of them take off to see what has happened only to arrive at the scene of a car accident. One of the drivers is missing from their car while the other is stuck inside. Faudrey offers to help Audrey since Nathan has gone off to keep others from driving into the accident scene. Against her better judgment Audrey uncuffs Faudrey to help her with the injured man, it seems that Audrey can already tell the Faundrey is not a threat but she can’t admit it yet. As Faudrey pumps the mans chest she uses an old camp fire girls technique that Audrey recalls. You can see it in her face, yes she is starting to get a little creeped out, finally. Audrey leaves Faudrey with the injured man as she goes off to call her ex-boss Agent Howard. Its obvious she is having doubts about herself as she needs to touch base with the one person she has in her life besides those in Haven, even though she is ex-FBI. She mentions to him about Faudrey and he decides to come to town to check it out. Now I don’t know about the FBI at all but wouldn’t he have other things to do besides showing up to check out an impersonator? I mean life and death issues all over his jurisdiction or something? It seemed suspect to me. She actually left the FBI for personal reasons something about needing time away or to investigate her mother’s death. Ok I am vague on the details I am sure the reasons will resurface over the season. I suddenly feel like Haven is one of those places where the patients are running the asylum. Hmmmm I wonder if that means anything in the plot. 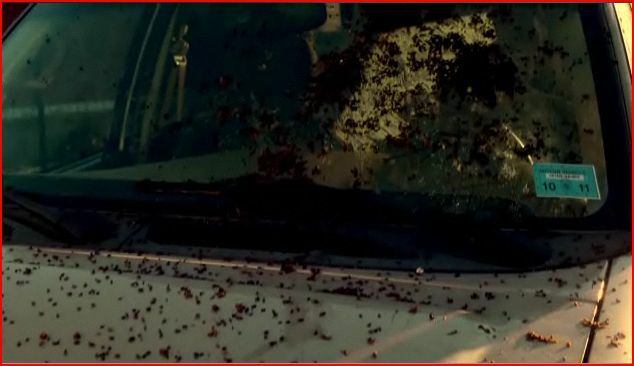 Nathan notices that the swarm was gnats on the car of the man who left the scene of the accident. The other cop finds beer in the car too which suggest is the reason the person didn’t stay around. Faudrey comes over to find out again when they are going to the station. Audrey proudly tells her she has spoken with her boss though she does not tell Faudrey that she is no longer FBI. 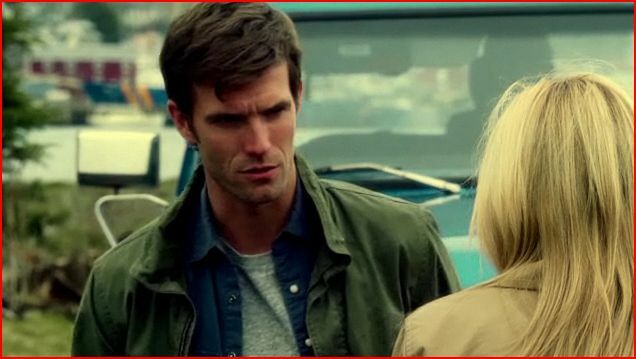 Audrey sends her to the station with a couple of other cops after she tells her she is just more trouble like others in Haven, especially because Faudrey has her memories. Duke, who reminds me of Adrian Brody, arrives to tell them about the bloody water at the church since Nathan hadn’t returned his calls. It’s a good thing its a small town LOL. Blood, frogs, gnats and yes it sounds like a biblical plague. Duke looks up into what is now a crowd that has gathered, to see an afro american woman he recognizes; a second later she is gone. Now the first time I saw this I didn’t think too much about it but now I wonder if she is real. I am going to keep that in mind as I re watch this time.I know she may have just wandered off. Duke leaves them before they decide to split up. 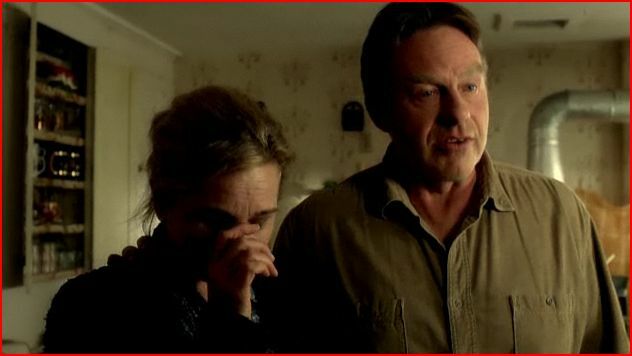 Nathan is going to check out the bloody water at the church while Audrey is going to the station to deal with Faudrey. Before they can go anywhere the nearest Fire Hydrant explodes with another swarm this time of flies, then a mailbox, then the canon statue and the swarm is off again as though they have a plan or route in mind. After the break, Nathan arrives at the church. The pastor says it’s the ten plagues of Egypt. Dead live stock, boils, flaming hail, locust, darkness and the death of the first-born son is up next the pastor says in his creepy voice. See I think pastor is getting off on the idea of God’s revenge on Haven. I almost think he had something to do with it. Nathan thinks the pastor is almost too excited about what is happening though the pastor denies it. In the last episode of the first season he told Nathan that things were going to change. He wants the cursed aka troubled to ask forgiveness. Nathan is adamant about the troubled in the town being born the way they are with no need for forgiveness against themselves. I agree with Nathan sometimes people are born different, they learn to accept themselves and move on with their lives if they are lucky like Nathan. The idea of Haven being a place for those people is kinda cool to me. That pastor needs to find a new home if he can’t accept the people as they are for him to call them cursed, condemned, sinners and such is just a way to keep them coming back to church for something they won’t ever find there and that is self acceptance. Okay that is my two cents. At the station, Audrey runs into Vince and Dave the brothers that run the newspaper. They remind her the chief, needs to be buried. Now why are they even worried about the man being buried? He is with his son and that should be a private matter. Sometimes I wonder why people don’t mind their own business more than they do. Audrey walks away when they mention they want to put Nathan’s name in the pot to be new chief. I am glad she didn’t talk to them any longer she has enough on her mind with Faudrey and the plague. Audrey tries talking to Faudrey but she won’t confess to having anything to do with the plagues. Audrey decides to work on the case which means she is using the map in the same room with Faudrey. Faudrey actually assists while she figures out what is going on and it helps that they think alike. Audrey leaves again after its decided the swarm is following the trail of the man who left the scene of the accident. Duke arrives on his boat to find the African-American woman he saw in the crowd earlier. Evidence Ryan, Evie, who he hasn’t seen in three years and is in town for a job. Duke acts as though he is unhappy to see her mostly but it shows that he really likes her, at least to me. She leaves after a few minutes but plans to return later. Nathan and Audrey arrive at the home of the person who owns the car that was involved in the accident that left the scene. The find out from the parents that T. J. is the man who likes to drink and has been missing from his home for a week. T. J.’s wife died during child-birth which set off T. J. drinking spree or so it is believed. Nathan and Audrey leave after they receive an urgent call. 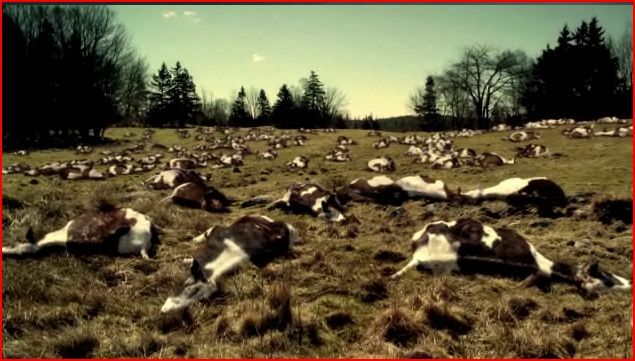 They arrive in a field with a quarter-mile of dead cattle, the dead live stock that goes along with the plague theory. After the break, Evie arrives at Duke’s restaurant. Duke weakly asked her to leave but she only ignores him while she goes on about some big deal she is doing. She acts like a wheeler-dealer someone always out to make a buck. Duke has no interest in what she is selling, to speak. She saved his life but then she ruined it according to him. “I don’t want to be in business with you or in bed with you I want nothing to do with you,” Duke says. He walks away as she has that look as though she is going to find a way to get him to go along with her plans for him. Nathan arrives at the station before another cop brings in a report about a bunch of skin burns, yes you guessed it, boils. The other cop asks about the chief, but it seems only a handful of people know that Chief Garland is in Nathan’s car, yikes. 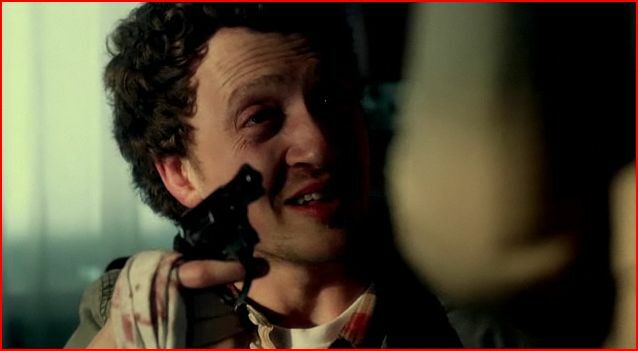 Nathan lies to the man without even flinching, I think that is kinda scary but he is a cop. How are they going to explain that? I don’t know in Haven it might be easier than I think. Faudrey notices on the board that they are using to keep track of the situation that the victim/T.J. or whatever is causing the plagues has stopped moving. Nathan gets the location of the boil victims which is in the center of where T.J. stopped last. Faudrey goes along with them since she was the one to notice the pattern. I think Audrey is getting used to having her around; its obvious by now that there is a connection between them. Okay so I have a theory now; I wonder if Audrey has a split personality? Although if that was it then Nathan would not see her. I saw the movie Identity and ten of the characters where all one person; is it possible this show is similar. I don’t want to look up the Colorado Kid the story that Haven is derived from because I don’t want to cheat but I am putting that out there for now. I have decided to go spoiler free for all the shows that I recap just to avoid any confusion in my mind. At the crime scene, Steve who now has boils, is the gun shop owner. The story goes that T.J. came in wasted wanting to buy a gun but Steve wouldn’t sell it to him. Steve did send him to Lil Mike who will sell to anyone with cash. Oh ok so Steve just ratted out his competition to the cops; what a winner. We also learn from Steve that Mike hangs at the Grey Gull. The fiery hail begins once they arrive at the Grey Gull which belongs to Duke. They see T.J. just before he takes off in the woman’s car that he stole while at Steve’s shop. 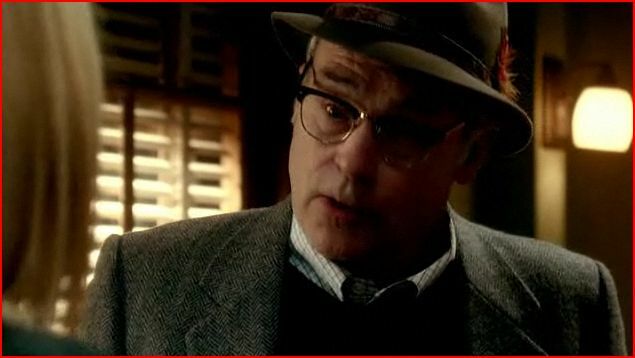 After the break, we find Faudrey trying to figure out why Nathan and Audrey think that T. J. had anything to do with the plagues. Audrey explains they call the people with issues in the town, troubled. I think troubled is an understatement. T.J. has been at the Gull drowning his sorrows since his wife died because he thinks its his fault since he was not present at his baby’s birth according to Duke. Mike confession goes something like, “hey all I know is T. J. had a gun when he left,” dude isn’t saying he sold it to him, big surprise. I don’t particularly believe this was a necessary scene except to identify it as Duke’s restaurants since we didn’t not see the name earlier and to show us Yes its where Mike hangs out like Steve said. 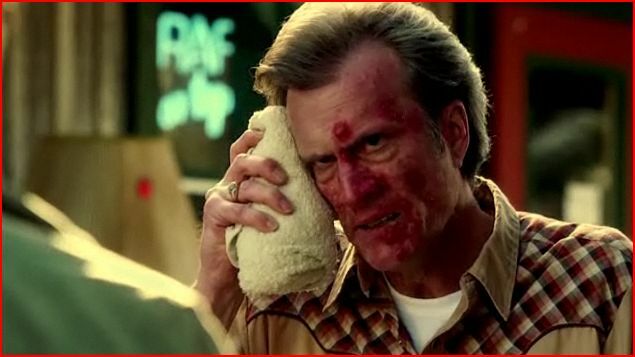 Now since T.J. had been hanging around there too wouldn’t he already know about Mike’s fondness for selling fire arms??? I mean this town isn’t that big Oh and also with the few people around why didn’t the cops already know about Mike? T. J. got the gun to protect his son but I am not clear on this sense the kid is infant except T.J. thinks he can protect him from God and the plaques, but we will see what he means soon enough. Duke is invited on the investigation by Nathan just in case the plague of the first born son comes into play as they go to T.J.’s parents house or soon after. “Why does everyone think I want to help?” Duke says to no one in particular. In the car on the way to see T. J. Nathan and Audrey finally discuss what to do with the body of Nathan’s dad, Garland, the chief of police. It’s funny to see Duke and Faudrey’s reaction to finding out the cooler in the back contains the remains. The darkness begins to fall as they are on their drive, the plagues are happening faster now. They arrive in the darkness to find that pastor with several others from the congregation outside the house. He is here to help, yeah right; he is probably laughing inside ah the sinner is getting his comeuppance or whatever he would say. The parents explain that T. J. is inside with the baby and a gun; Audrey goes in armed with Faudrey. They look around as they try to find where T. J. might be. In the nursery they find T.J. with Aaron, his son. He wants to kill himself because he believes like the pastor that the plagues are his fault. The darkness lifts then outside Audrey sees the first-born sons on the lawn are looking sickly, falling on the ground gasping for air including Nathan. 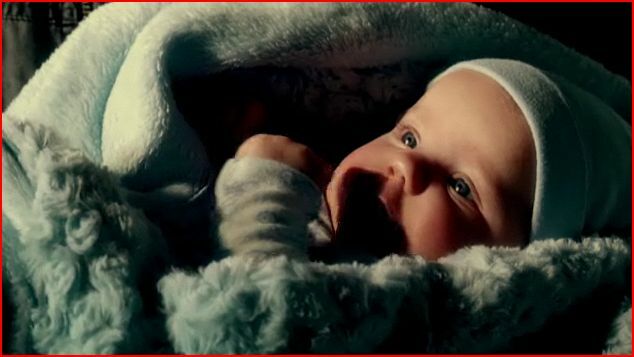 The poor baby was even gasping a bit which was too sad. Audrey figure out that since T. J. in his grief had read the bible earlier at the Good Shepherd, particularly Exodus, that he had brought the plagues into being by his actions. I get the idea of this but why was it just him? I am thinking it was the fact that he was troubled that has caused the manifestation of the plagues. Audrey tested her theory by grabbing the Velveteen rabbit book off the shelf to have T. J. read. It was so sweet to hear the baby laugh as his father read to him. The image of a rabbit shadow on the wall was a good illustration to show it was working or cheesy everyone will see it different, I liked it. The men outside also stopped dying. That mystery was solved. They left T. J. to bond with his baby. Nathan faces off with the pastor outside who like I thought was somehow involved. He is messing with fire and lets see if he doesn’t get burned in the end. He basically admits he is up to something when he tells Duke he had to be careful with the company he keeps. I think Evie is the person the pastor is referring to though Duke owns a bar so it could be anyone. Pastor also misquotes the bible, “the lion will never lie down with the lamb.” I was like huh? I guess that is to show that there is not doubt he is up to no good. Evie walks up and we learn that she is Duke’s wife. I thought this was kinda cute; well I am a big fan of interracial couples. No one had any idea that Duke was married they are all sufficiently surprised at the announcement. Duke pulls Evie over away from the others to admit he cares. He cares enough to ask her to leave town so she won’t get hurt but she is not listening. She only wants to see what scam he is pulling; I guess that was their thing back in the day. 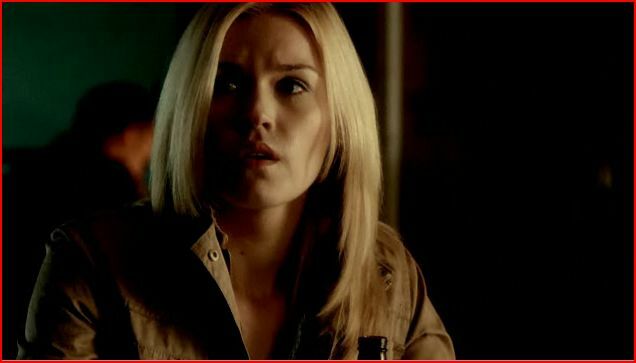 Duke warns her again about Haven but she decides to stay in town nonetheless. This is going to be an interesting storyline to follow. After the last break, Vince and Dave want Nathan to be the interim chief but he wants to think about it. They are encouraging him to tell people something about what happened to the chief, Nathan plans to say his father died at sea. Duke said his father died at sea also I guess that is the catch phrase for strange deaths. Nathan digs a hole for his father’s remains, which are actually rocks because of what happened to him. Duke shows up with a shovel to help. They bond over their dislike of the pastor and things they haven’t shared with one another before Duke begins to shovel dirt. That night at the Gull, Faudrey and Audrey do their own bonding. Audrey shares a story about a girl that she was in a foster home with named Teresa who had bad experience with the father. Audrey took care of the problem by stabbing him in the neck with a pair of scissors though the man never knew what happened because he was drunk. Faudrey provided the detail to the story, the scissors where Mickey Mouse she adds when Audrey finishes her story;neither of them had ever told anyone that story until then. They stare at each other for long moments until the FBI shows up in all its glory. Audrey instructs Faudrey to not tell the FBI anything. Agent Howard addresses Faudrey as Audrey and Howard looks nothing like the Howard that Audrey speaks to on the phone all the time. Faudrey lies to Howard when he questions her where the imposter has gone, “she is in the wind I think she went toward the Canadian border,” she lies. The last scene shows Audreys surprise at Faudrey’s answer. My final thoughts on this episode are that I really missed this show. I look forward to see what happens next. Luckily it comes on after Supernatural even though I know they are reruns because its summer its still a good thing. Audrey and Faudrey’s story is going to be one interesting ride. I wonder if one of them is the Teresa they mentioned or if Audrey is really Lucy. Oh and Duke’s storyline with Evie I hope will get very hot and maybe a bit scary since I saw in the finale that Duke has a list of people on his wall. I think he wants to know who his future killer is going to be the person with the tattoo that he saw in his vision or flash of site. It was sad for Nathan to lose both of his father’s in the finale but hopefully he and Audrey can help each other out the way they always have. I am also curious about what Dave and Vince are up to they seem to be hiding some serious secrets well along with others in the town. I am glad the show is back for this long hot summer. Feel free to comment, Thanks.